In my book I believed in Primo Levi getting his tattoo number 174,517 at Auschwitz – and accepted his argument, that the numbers were sequential so that that number of prisoners had received tattoos before him. * All the tattoo numbers are five-digit. They are not sequential. * Only Jews claim to have them. * Tattooing would take twenty minutes per prisoner, and why bother? We get phantasms of ‘interchangeable needles’ but these sound most unhygienic. Would you agree to them when typhus was raging? In my study of published articles by Revisionists (put up here: http://whatreallyhappened.info/journals.html) there was nothing on the subject. Does that really look like German technology? When I was in the Weiner library (Russell Square, London), the ‘world’s biggest Holo-library’ checking out its newly-released ITS database, l asked the lady in charge of it if there was any data on the tattoo-numbers, and she found that there wasn’t. I'm glad you posted that. I'm skeptical too. I've been thinking about this very topic. Tattoos are against Jewish law. If you get tattooed you can't be buried in a Jewish cemetery? Of course this is probably if one gets a voluntary tattoo, and I've heard even that is flexible. But tattooed numbers: I've seen huge numbers. I've seen small numbers. I think I've seen numbers in different angles to the forearm. I've seen Psyche Warfare footage showing the number on the stomach. Tattoos on Jewish prisoners would have been the biggest PR field day for the allies. A PR nightmare for the Germans. So in 1943,44,45 are there all kinds of references to Jews getting tattoos at Auschwitz? Because whereas the alleged gassings would be top secret the tattoos could not have been top secret. I've also seen people lying who had a number tattoo, but plenty of people were no doubt at Auschwitz and also happen to be liars. I've seen a tattoo in Russian footage where the 3 or some was backwards, or some number, because the Russians use a cyrillic numerals and didn't copy correctly. But it begs the question: all these people after the war who had a tattoo. How then, did that come about? Also tangentially connected are the SS blood type tattoos. This shows that tatooing as a way to ID was there. But if "Special Treatment" really meant special treatment, in other words, because there was a Public Relations war going on, give Jews special treatment so it's harder for them to say they are being treated bad, then how would a tattoo be in the equation? And as a quick glance at the Porter article points out: the famous footage of 3-5 year olds rolling up their arms to show tattoos. Really? A little kid gets a tattoo? As Porter points out: tattoos take a long time. Everybody knows that with the ubiquity of tattoos. Everyone knows they're painful. I think there's another thread on this somewhere also. If I remember correctly, Joachim Neander provided some tattoo research somewhere. I checked up the official version on USHMM and Jewish Virtual Library as well as Wikipedia. They seem to be near-identical, therefore a single source. [D]espite the importance of the tattoos, as testament, symbol, and historical artifact, little scholarship has been devoted to the subject. There exist virtually no official period documents relating to the practice; what we know stems from anecdotal evidence contained in camp records and the accounts of those who were at the camps. The first series of prisoner numbers was introduced in May 1940, well before the practice of tattooing began. This first series was given to male prisoners and remained in use until January 1945, ending with the number 202,499... Approximately 90,000 female prisoners were identified with a series of numbers created for female prisoners in March 1942 until May 1944. That's only a part of the total number. It is generally accepted that the tattooing of prisoners began with the influx of Soviet prisonersofwar into Auschwitz in 1941. There should be at the very least tens of thousands wandering around with these tattoos in the years after the war, but for how many is there clear evidence? How many prominent former inmates like Elie Wiesel and Simone Veil decline to show their tattoo? Try searching for "Auschwitz tattoo" on Google Images. Very few black and white photos and some of them are duplicates. (They include the well-known "it must be there somewhere" tiny kids filmed by the Soviets.) The more modern colour photos also include duplicates and almost as many copy-cat imitation tattoos on young people. By the way, CCS, Cyrillic numerals are not relevant. They haven't been used since the time of Peter the Great! It is not alleged that only Jews were tattooed. Gypsies and Soviet POWs are mentioned. Tattooing at Auschwitz-Birkenau was introduced by the camp authorities to facilitate the identification of corpses in response to the high death rate among inmates. Although prisoners’ uniforms displayed serial numbers assigned at registration, there was no way of identifying a body once the uniform had been removed. To address this problem, prisoners’ serial numbers were written across their chests with a copy pencil. The first tattoos were performed in 1941 on Soviet prisoners, using a special metal stamp holding interchangeable numbers made up of needles about 1 cm long. This stamp was then punched onto the left side of the prisoner’s chest and ink was rubbed into the wound. Polish prisoners and other inmates were subsequently tattooed in this manner. In 1942, a single-needle device replaced the metal stamp and was used to pierce serial numbers into the left forearms of Jewish inmates.3 Tattooing became routine for other categories of non-German prisoners at Auschwitz-Birkenau, such as Gypsies, who were tattooed with the letter ‘‘Z’’ before their own unique series of numbers. Some Jewish inmates had a triangle tattooed below their numbers. A separate series of tattoo numbers was issued for male and female inmates. 3. Iwaszko T, Kubica H, Piper F, et al. 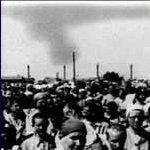 Auschwitz 1940–1945: Central Issues in the History of the Camp, vol. 2. Oswiecim: Auschwitz-Birkenau State Museum 2000; 22–26. I don't own the cited volume, so can't check it without a library visit, but I do have a copy of "Tattooed numbers in the camps of Auschwitz-Birkenau" by Gilles Cohen (1993), and he quotes heavily from Taudeusz Iwaszko's 1980 paper "Tätowierung der Häftlinge des KL Auschwitz", which appears to be the most detailed study about tattooing at Auschwitz. Danta Czech's Auschwitz Chronicle details (perhaps not without mistakes) on which days what numbers were given out in the camps. I don't want to sound rude astro3 (anti-revisionists will certainly have no such qualms if they decide to comment on your thread), but I think you're on completely the wrong track here; nos. 1, 2 and 4 of your bullet points can easily be shown to be nonsense. I've lived the bulk of my life in the NY/NJ and have known LOTS of Jews, some of whom were allegedly "survivors." I am now a middle-aged man and have never once seen an Auschwitz tattoo. I also asked a Jewish female acquaintance about this - she had never seen one either, and she lived a number of years in a Jewish neighborhood in NYC in her youth, as well as being surrounded by Jews all her life! Purely anecdotal, of course. But an observation all the same. 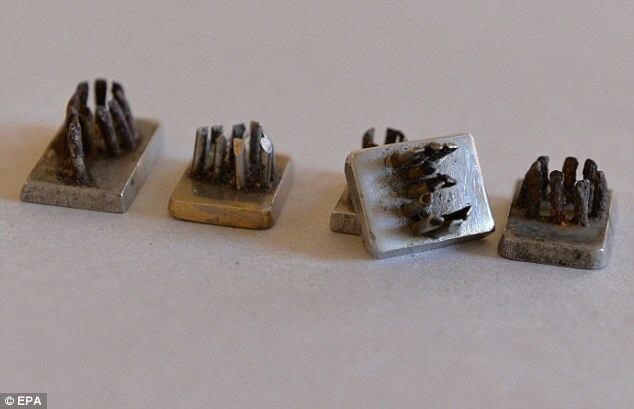 The Daily Mail – ‘evil’ looking tattoo devices' article is preposterous, those tools look like chisels or drill bits of some kind that someone has attached to small steel plates. It's as if the shysters think that tattoos never occurred worldwide until the Germans invented these Rube Goldberg contraptions. But with the absurd 'holocaust', proof of anything is not required. FWIW, I recall a Jewish man I used to play basketball with who had a tattoo on his forearm, but that's the only one I've seen. Jews certainly know how to make the tattoo story questionable with fakes like this. Until there is more in depth research I feel there's more mileage gained from the fact that the carriers were not 'exterminated' as they should have been according to marketed impossible storyline. [extracted from tortured] Auschwitz commandant, Rudolf Hoess, quoted in Shirer, p. 968, Rise and Fall of the Third Reich. I'd like to know how much talk there was about Auschwitz tattoos mid-war. The whole tattoo scenario and resulting claims is too loose for my liking. Not Germanic, not organised, not comprehensive, made up on the run etc etc. It's got more holes than a Swiss cheese. Those with tattoos love to show them and take pride in being 'branded' ones. Those who should have one, claim to have one, and we all know who these famous ones are, refuse to show them and talk about their experience. Tattooing just before gassing is claimed in the scanned text. Why then would the Germans have even bothered? Well, they wouldn't have bothered, if the impossible 'gassings' tale was true. Identification tattoos would not have been necessary for those 'about to be gassed'. Again, it all makes no sense. That's great Horhug. Thank you for sharing. It's way past my bed time so I'll have to look at these tomorrow and post any comments I might think of. Hannover wrote: Tattooing just before gassing is claimed in the scanned text. Hannover wrote: Why then would the Germans have even bothered? The scanned text doesn't claim they bothered, you just made it up. Hannover wrote: Well, they wouldn't have bothered, if the impossible 'gassings' tale was true. Again, they haven't claimed anyone did bother. Hannover wrote: Identification tattoos would not have been necessary for those 'about to be gassed'. That's precisely what the USHMM says. Hannover wrote: A patently absurd storyline. Probably because it's your straw man. You can't blame them for that. Hannover wrote: Again, it all makes no sense. Again, that's because you're arguing against claims that the book doesn't make. Rabbit, I see you are behaving like a child, again. Must be your anxiety over your inability to support your laughable 'phosgene gassings at Natzweiler' claim that I challenged you on. Anyway, have you lost your ability to comprehend the English language, or did you even read what Horhug scanned? Regardless, there are definite references to my points, I'll spoon feed them to you. So there, I have you yet again. Hannover wrote: Rabbit, I see you are behaving like a child, again. Must be your anxiety over your inability to support your laughable 'phosgene gassings at Natzweiler' claim that I challenged you on. It's Mattogno's phosgene gassing claim, not mine. My position purely is that Mattogno's body of work of the alleged gas chambers of the Third Reich demands that his opinion is taken seriously. You dodged all invites to actually address Mattogno's arguments, instead resorting to childish hand waving and begging for spoonfeeding of documents anyone else would simply google for themselves. Hence why I opted not to waste further time on your irrelevancies. Hannover wrote: Anyway, have you lost your ability to comprehend the English language, or did you even read what Horhug scanned? There are definite references to my points. It speaks volumes about you that you're shameless enough to post that rubbish. No where does in those scanned pages does it state, or even hint, that those gassed on arrival were first tattooed. You dodged all invites to actually address Mattogno's arguments, instead resorting to childish hand waving and begging for spoonfeeding of documents anyone would simply google for themselves. Hence why I opted not to waste further time on your irrelevancies. And you believe in Mattogno's rare error, yes you said you do. Since Mattogno can't support his 'phosgene gassings' position it's curious that you hang onto to such absurdities. Oh well, that's your problem, Rabbit. I dodged nothing, I addressed his points which were incoherent & did not give proof of laughable phosgene gassings. You've embarrassed yourself and are now at a loss. There is no proof of phosgene gassings, Mattogno nor yourself can produce any. If you could, you would. You cannot. There we go, more laughable panic mode language. I merely copied it, Horhug posted it. Get over it. The text is very clear about claims of tattooing just prior to 'gassing'. It's now confirmed, you do not comprehend English text that is spoon fed to you. The field is mine, sir.